At the beginning of each week, I have made it a practice to read the Scripture lessons for the coming Sunday. I read them several times during the week – sometimes to myself, sometimes out loud, to prepare myself for what I will hear in worship. As the week progresses, I often find myself becoming curious about how the preacher will ‘unpack’ the lessons – What will be his focus? What stories will he tell? What will he offer to help to make this lesson relevant to me? 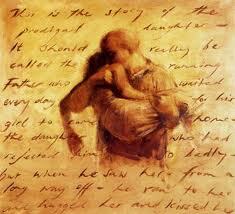 The Gospel lesson for last week happened to be the story of the Prodigal Son (Luke 15:11-32). Like so many other passages of Scripture, it is a story that is known beyond the doors of the church. It is the story of the son who asks for his inheritance, leaves home and squanders it, returns home ready to work as a slave simply to survive, and is welcomed home by his father with extravagant love; even as his older brother complains that he has never been treated so well by his father. It is a story I have heard dozens of time. I have preached on it, heard it preached, and ready many commentaries. I can so relate to the older brother. I try to live rightly, honestly, respectfully. I haven’t squandered my money or possessions in wild living. And it takes very little to scratch the surface and begin to feel the discomfort of seeing myself in a mirror I didn’t want to hold up. Thanks to the wise voices of Rev. Steve Garnaas-Holmes (www.unfoldinglight.net) and Br. Geoffrey Tristram (www.ssje.org), I have been with this story in a profoundly deeper way this week. Steve writes a daily blog, often using the Scripture lessons for the week as his guide. Last week, several of his entries focused on the Prodigal Son story – each taking a different perspective. There was one, however, that made me stop. In it, Steve focuses on the fact that both sons – the one who leaves and uses up all his inheritance, and the one who stays home and works for his father – both of the sons focus on their father’s ‘stuff.’ They want what they think is owed them; and by placing their attention on stuff, they lose sight of the father who loves them beyond all measure and reason, and simply wants to celebrate that love with them. Is this what we do with G-d? Is this what I do with G-d? As I sat with this story, once again, I began to see more deeply how I squander my inheritance. Another opportunity for my growing ministry – I’ll take it! Another chance to meet new people – yes! Another exercise routine – absolutely! Another seminar to learn something new – of course! My calendar is full, my Facebook friends are connecting, but I find myself depleted, angry, short-tempered, restless and exhausted. It is not as though G-d is not in these wonderful things – no. It is that I have taken them in exchange for simply being with G-d – that is, in exchange for being with my source of life energy*. So I find myself with the need to stop – once again; to recognize that I am lost, in my own way; and that I – like the prodigal sons – need to return to that endless, extravagant, forgiving, ‘crazy love’, as Br. Geoffrey puts it; and be found and welcomed home. The story of the brothers and father is so powerful, and it transcends time, place and gender. But what is truly at the heart of this story for me is LOVE! When the Beloved sees me, sees you dragging our feet back, or turning our gaze back, or even just starting to turn . . . the Beloved RUNS to us! Embraces us! Kisses us! The holy welcome. Without that, I am lost.